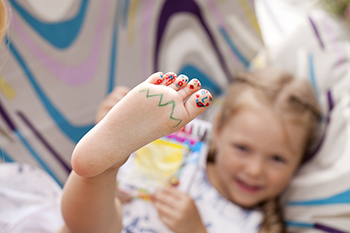 Did you know that Dallas Podiatry Works also treats foot conditions in children? In fact, our compassionate podiatrists consistently get 5-star ratings for our fun and unique approach to children’s foot care in Plano, TX. Your child’s feet are unique due to the fact that they are still growing, and their growth plates have not completely developed. If you suspect that your child’s feet or ankles are not developing correctly, or if your child has sustained a foot injury or ankle injury, we are here to help. Children commonly experience foot problems like heel pain, flat feet, ingrown toenails, and warts. At Dallas Podiatry Works, your little one will receive state-of-the-art podiatric care from compassionate, experienced professionals who keep you informed and involved in your child’s diagnosis and treatment at every stage. We use conservative treatments to make remedying your child’s condition as easy for you and your family as possible. We start with the least-invasive approaches, only moving to more involved treatments as needed. Your Child Deserves The Best Podiatry Care. Schedule Your Child’s Appointment With Dallas Podiatry Works Today! If you’re concerned about any foot or ankle issues, your child deserves to see the best podiatry practice offering children’s foot care in Plano, TX. If addressed early enough, your child won’t miss a beat – or a game! Call our podiatry office at 972.566.7474 or click here to schedule your child’s appointment. Our foot specialists and staff are also always happy to answer any additional questions you may have about your child’s foot or ankle condition.